Since 1960, The Quinlan family at Kerryfish have been hand-producing the finest Irish smoked salmon. We offer a choice of smoked salmon to suit every taste and preference, from our award-winning Superior Smoked Salmon to our Great Taste Organic Smoked Salmon and Great Taste Wild Irish Smoked Salmon. Our smokehouse prides itself in its unique curing and smoking process which ensure that each smoked salmon produced possess the perfect texture and delicious flavour for which Kerryfish and the Quinlan family have become world famous. Each Salmon is treated individually and we give each salmon the time and care required to produce great tasting Smoked Salmon. 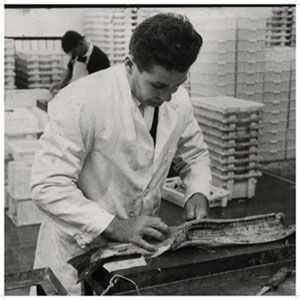 It is the obsessive attention to detail that puts Kerryfish and Quinlan’s smoked salmon head and shoulders above the supermarket mass produced smoked salmon that it is too readily available nowadays. In 2014 the Quinlan family was recognised for their amazing smoked salmon when for the first time entering the Great Taste Awards we scooped Two Gold Stars in the Guild of Fine Food’s Great Taste Awards. We are so excited at this award and are so proud that all the hard work done over the years has been recognised. Our customer list grows year on year and as well as supplying private customers, we also supply a growing number of Ireland and Europe’s most prestigious hotels, restaurants and pubs, including several Michelin starred restaurants.